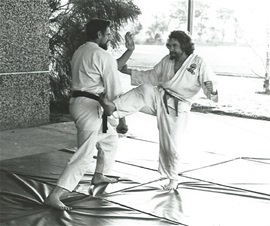 Question: When did you first begin training in the martial arts? Answer: My martial arts training started in 1966 at age 17 under Paul Anderson (The Mighty Apollo), a strong man who performed incredible feats like pulling a tram up Bourke Street with his teeth. He was the pioneer of karate in Melbourne. Q: How long did you train with him? A: That was for about 6 months until I joined my brother as a student of Tino Ceberano (Kate’s father), who taught Goju Kai Karate. I trained with Tino and later Sal Ebenez for about 4 years until I was sent to the far west of the State on my first High School teaching appointment. There I continued to train solo for two years until I was appointed to Yea high School. Q: What was the training like with Tino? A: Gruelling with the emphasis on athletism. The two main kata were Sanchin and Tensho both incorporating ibuki breathing, a type of yogic breathing meant to toughen the body. Kumite or free sparring was common along with makiwarra (padded posts) training at home. Tamashiwari (breaking boards etc) was more for demonstrations. Q: Were you able to continue training at Yea? A: At Yea I investigated a Goju Club at the Puckapunyal Army Base near Seymour but unfortunately it had folded just before I arrived in Yea. Fortunately there was a fellow teacher at the school John Comerford, who trained in Tae Kwon Do, Aikido and Judo under various instructors. I had always been interested in judo so started training with him whilst still maintaining my Goju karate. We did Tomiki Aikido under John Gay and judo under Wally Strauss but with John also developing his own jujutsu system. He was very much an eclectic martial artist taking things from many disciplines. Q: When was your first contact with Chinese martial arts? A: It was during this period that I did a summer school course at Monash University in Wing Chun Kung Fu. I can’t remember the instructors name but I know he was a fellow student with Bruce Lee in Hong Kong under Master Yip Man. He taught me the Siu Nim Tau (Little Thought Form). Q: What about Tai Chi? A: I had read about the mysterious martial art Tai Chi and was intrigued and keen to find out more about it. Then one day in 1979 a young man Rob Amor appeared who was on a teaching round at Yea Primary School. He blew me away with his Tai Chi ability and the speed and power of his punching. Rob kindly started teaching John and myself the solo exercise, correctly with the steps of course. But by the time his teaching round had finished we only knew half the form! I phoned him in Melbourne and he said if I wanted to continue learning Tai Chi I would have to travel to Melbourne and either study under Professor Wong, primarily a Pak Mei (White Eyebrow), exponent, or Rob’s Master Rocky Kwong. I fortuitously chose Rocky and for the next 3 years travelled every Sunday from Yea to North Melbourne for several hours instruction and then for the next 14 years from Maldon to Melbourne. Q: Apart from Rocky, who were your instructors at North Melbourne? A: The Head Instructor under Rocky was Brian Mac Gregor a highly adept exponent who along with fellow instructor Cheng Yu Fook taught me a great deal. I studied directly under Rocky and the above for 6 years and also with John Thirlwell after he came back to the club after building his house. Q: How did you come to found the Bendigo Tai Chi Club? A: In 1983 when we moved to Maldon Rocky asked me to start teaching. I started a class at the Bendigo YMCA but we soon moved to our present location at The Bendigo Trades Hall. 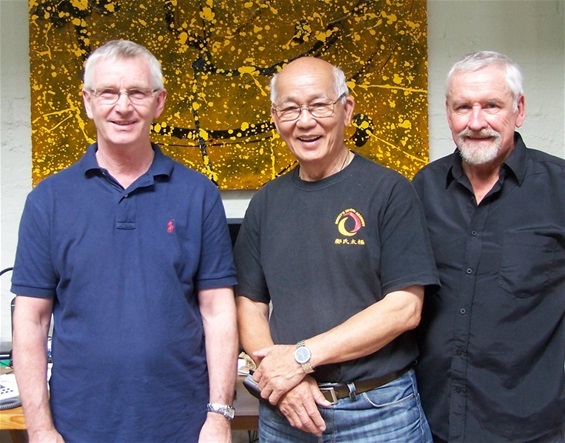 The establishment of other independent clubs led to the formation of the Australian Federation of Wu Style Tai Chi in 1985. Q: Rocky now lives in Perth W.A. do you still have contact with him? A: Yes, by telephone and occasional visits or workshop/seminars. Rocky has a soft spot for the Bendigo Club and he usually tries to fit in a visit to us if he is in Melbourne. He will always be my master, now grandmaster, because having become a disciple, (brotherhood member), through a sacred initiation ceremony we have a lifelong bond. Q: At Bendigo we do the Round Form as distinct from Rocky’s Form. Why is this so? A: In 1988 Grandmaster Cheng Tin Hung, (Rocky’s master), assisted by Dan Docherty from Britain conducted an intensive eight days and nights seminar at Melbourne University. At this seminar I was taught the Round or Circular Form plus the Hong Kong sabre. I also had the honour of being personally initiated by Cheng Tin Hung. After the seminar I decided to include the Round Form as the intermediate form of the club. For the advanced senior student we teach Rocky’s Form. In my opinion the Round Form is the pre-eminent health and spiritual form whereas Rocky’s form is more martially orientated. Of course neither form is exclusively one or the other – both have those aspects. Q: What about the input of Master John Thirlwell? A: That has been enormous! John started teaching at North Melbourne in 1983 and has been my most direct instructor ever since. He is Rocky’s foremost student and truly a master in his own right. In 1997 he started teaching at the Northcote Club and later at Jells Park. I attended every second Sunday until recently. In 2000 we started regular workshops at Maldon with John for senior students from the Bendigo Club. They continue to this day. A: I would like to make the point that my life long passion for metaphysics has dovetailed into my martial arts training culminating with my Tai Chi involvement over the past 30 plus years. I feel privileged to have come into contact with all my teachers but especially Grandmaster Rocky Kwong and Master John Thirlwell. John in particular has helped me on my personal Tao. Alan Smidt died in 2012. Tai Chi remained his passion to the end and he continued with his practice and teaching of Tai Chi until a few weeks before his death.